Grab a post from your archives and repost it! Add a few sentences at the beginning to frame it. Why you chose it. Why you liked it. And why it should be shared again. 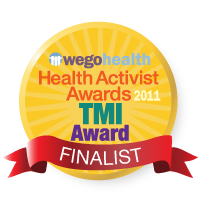 The post I want to share with you again came from another Health Activist Writers Challenge on April 11, 2012. The prompt was “Theme Song”, I was to imagine my health focus or blog is getting its own theme song. At the writing of this post I was losing my hearing, but I hadn’t lost it completely yet. I did not have a cochlear implant yet. I happen to be losing my hearing due to Meniere’s Disease. So music is very hard for me. I can’t really hear it even with my hearing aid, it sounds very tinny. However, I have tinnitus all the time, so I hear noise all the time. At this time I’m deaf in one ear, and have fluctuating loss in the other ear, the other day I was having a particularly low hearing day. Deciding my hearing aid really wasn’t doing any good, I decided to just leave it out. That was the day, I read this prompt. I thought, I couldn’t have a song. Then I thought, even when I’m deaf, due to the tinnitus, I will hear sounds all the time. NO, they won’t be sounds I want to hear, but I will hear sounds. I talked with a friend of mine, Vincent Morrison, who is a sound engineer. He agreed to help me record something similar to what I hear every day. Please know, my tinnitus changes A LOT. It varies constantly. But these sounds always seem to be around. We did put in some of the startling sounds that just come out of no where that scare me. We didn’t make it as loud as it can be. (I did want people to be able to listen to it.) I wanted to represent that my tinnitus can be softer, a medium tone, and I would say deafening…but that would be silly wouldn’t it? So on a better hearing day, my dear friend came over and he tried his best. I must admit I’m not the best person at describing sounds. I am so touched to have this recording. Trying so long and so hard to explain just a little of what I hear has been so hard, now…this is my song. #HAWMC Day 18 Don’t say that!